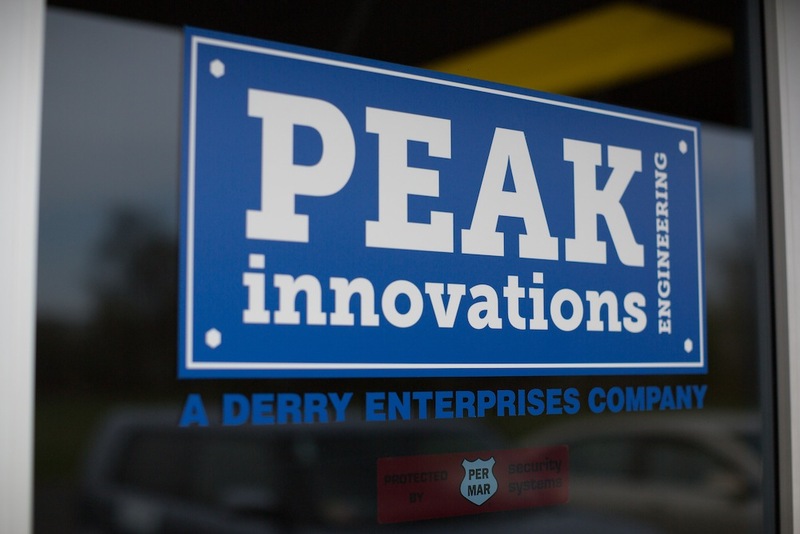 The transition from Archetype Joint to Peak innovations Engineering also brought a change in physical location. We are now proudly located about 1.5 hours west of Chicago in Machesney Park, IL. It is recognized that we measure torque when tightening threaded fasteners only because measuring bolt tension, the more important quantity, is much more difficult. The relationship between the torque applied to a fastener and the tension created from the resulting bolt elongation is most commonly described by T = F*K*D where T is torque, K is the nut or friction factor (nut factor for this article), D is the bolt diameter and F is the bolt tension or preload. Less common is a discussion of how this equation was derived, in particular the origin of the nut factor. Because this single variable K determines the critical torque-tension relationship, the factors that cause its value to vary about 300% across a range of common applications aren’t clear. Examining the sources and relative sensitively of these factors is the subject of this column. The nut factor, as defined in the above equation (often called the short form relationship), is in reality fudge factor not derived from engineering principles but instead arrived at experimentally to make the equation valid. 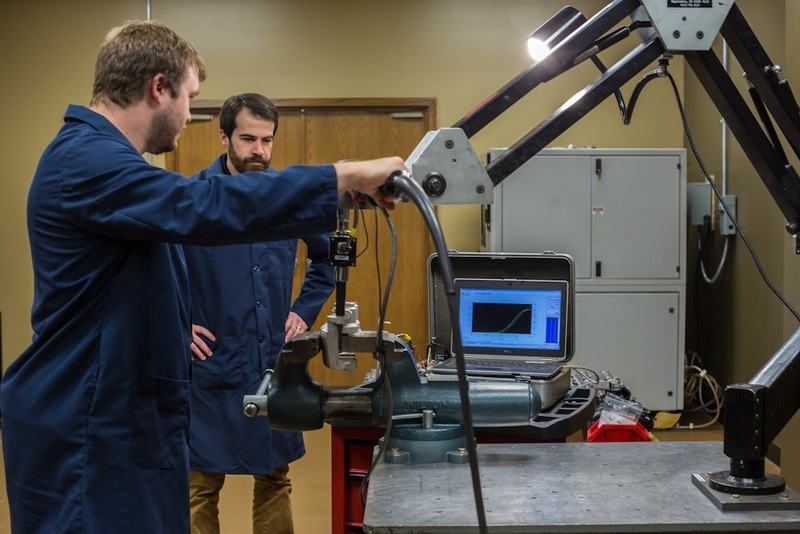 Various published torque-tension test procedures call for tensioning a threaded fastener in a controlled manner while monitoring both torque and tension. At the specified torque or tension, the nut factor is calculated by inserting T, D and F in the short form equation and solving for K.
Given this rather unsophisticated origin, one may be surprised to know that there are a number of published torque-tension relationships derived from engineering principles. They produce similar results to one another and take the general form T=F*X, where X is a placeholder for a series of terms containing variables of fastener geometry and friction coefficients. Three of the most widely-used examples are shown below. While at first glance they may appear to be quite different from one another, they are actually different forms of the same relationship and produce the same results. To understand what factors influence the relationship between torque and tension we’ll review the variables contained in these equations and quantify their relative influence. The Motosh equation is easiest to understand for most people so we’ll base our discussion in it’s format. Each term within the bracket calculates a length that when multiplied by the force generated by bolt tension (Fp) results in a torque. So each term is a reaction torque that resists the input torque Tin, and their sum must be equal to the input torque. The first term produces the clamp load due to the inclined plane produced by the thread pitch. 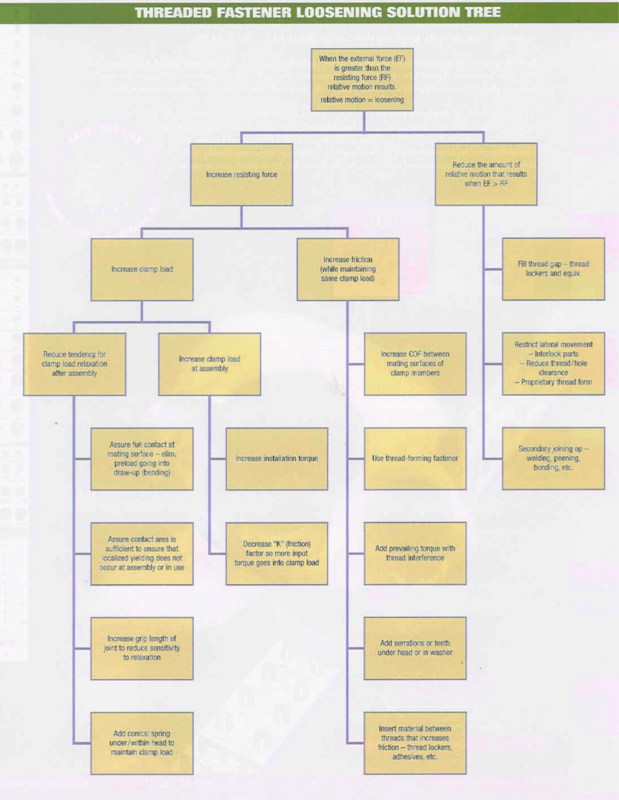 The second term is the resisting torque caused by thread friction, and the last term is a similar resting torque caused instead by friction between the nut or head face (which ever is rotated) and the mating surface. Therefore the value of each term indicates the relative influence of the variables in each term. For example, solving for an M12-1.75 flange head screw with 0.15 friction coefficients produces values of 0.28 N-m, 0.93 N-m and 1.35 N-m for each kN of tension. This breaks out to 10.9%, 36.3% and 52.8% of the 2.56 N-m total, and illustrates the common comment that “only about 10-15% of input torque goes toward stretching the bolt”. 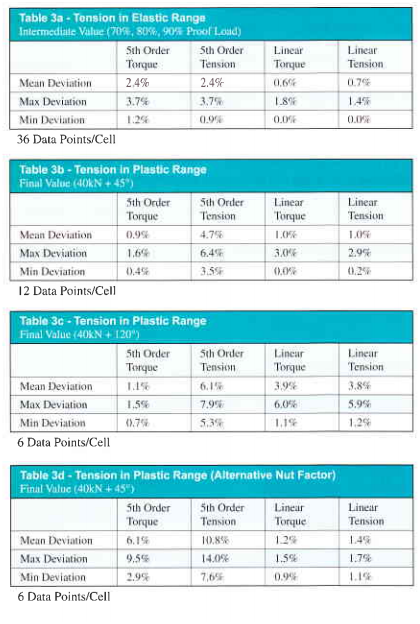 How do our design decisions influence the torque-tension relationship? To answer that, Figure 1 shows the effect of doubling the value of each variable in the short form equation while holding the others fixed. 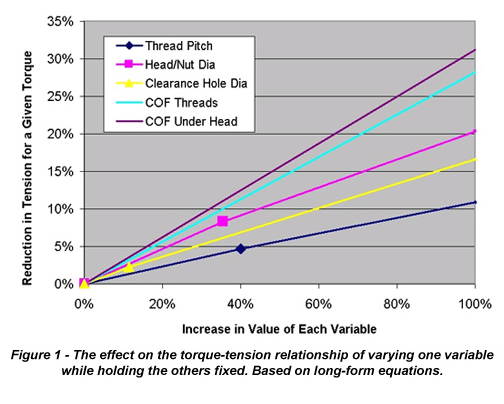 It shows that if the thread friction coefficient was doubled while the other variables remained the same, the bolt tension generated for the same installation torque would decrease about 28%. While friction coefficients occur on a continuous spectrum, the dimensions of standard fasteners and accompanying clearance holes tend to be discrete. To illustrate, Figure 1 also contains three points showing the effect of the following design alternatives; replacing a fine pitch thread with a standard pitch, replacing a hex head with a hex flange head, and replacing a close diameter clearance hole with a large diameter hole. For example, replacing a hex head fastener with a hex flange head (but not changing friction coefficients, thread pitch or hole diameter) increases the bearing diameter by about 35% which in turn will cause bolt tension to be reduced by about 8% for a given torque. 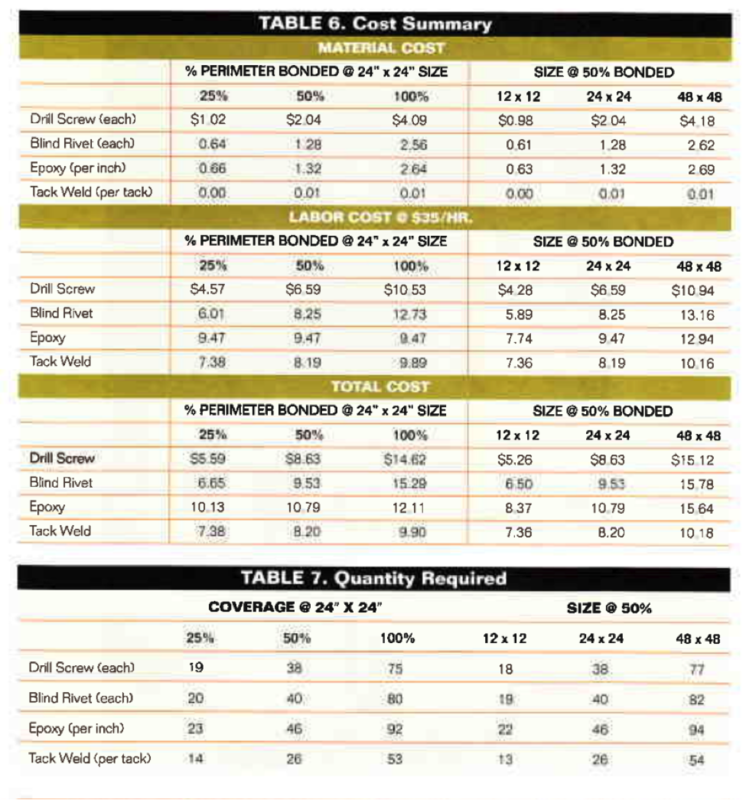 While these values vary a bit with fastener size, the relative importance of each variable will remain the same. We are sometimes asked the question. “If we perform a torque-tension test with a particular fastener diameter to calculate nut factor, do those results apply to other diameters, assuming all other conditions are the same?” In fact the nominal diameter is separated from the nut factor in the short form equation for just that reason, so that test results can be scaled to other fastener sizes. Is this an assumption based on engineering principles? Actually, it is only approximation as none of the terms in the long form equations contain the nominal diameter as a variable. Therefore the accuracy of using the nominal fastener diameter D as a means of applying a constant nut factor across all fastener sizes is dependent on whether the effected variables in the long form equations vary in direct proportion to the nominal diameter. The answer is shown in Figure 2 where the long-form equation is solved for standard pitch metric hex head cap screws with constant and equal coefficients of friction. The traces, normalized at M10-1.5, show a 4.2% maximum deviation between the short and long form equations, decreasing as the friction coefficients increase. The variable with the greatest relative deviation from nominal diameter through the range of fastener sizes is the thread pitch, as the pitch is somewhat arbitrarily selected, while dimensions of the thread form and the clearance hole diameter are all directly tied to nominal diameter. Because the first term containing the pitch diameter does not contain a friction coefficient, as friction increases the relative importance of pitch is decreased, and therefore the fact that pitch does not vary directly with nominal diameter has less impact on the result of the torque-tension calculations. Therefore, holding all else constant, applying a nut factor that was calculated at one diameter across a range of fastener sizes is a reasonable assumption. For best results the weighted mean diameter of the fasteners on which the nut factor will be used should be the basis of testing. In reality, most organizations apply nut factors across a greater set of conditions. 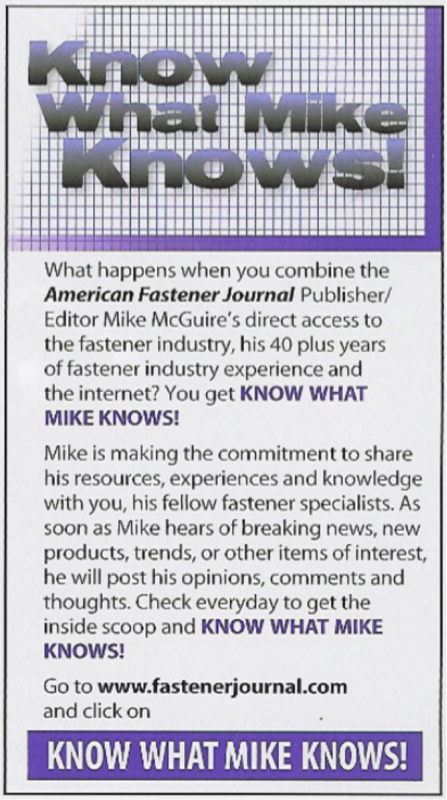 For example, fasteners may not have the same head style or clearance hole diameter. When a constant nut factor is applied to joints where geometry variables other than nominal diameter are changing, calculated deviations of 15% can occur between short and long form equations even for standard geometries. These comparisons using nut factor in relative to the long form relationships may imply that these impressive-looking equations produce the “right” answer due to their fundamental correctness. This is in fact not true, as there assumptions and approximations inherent in their derivation. 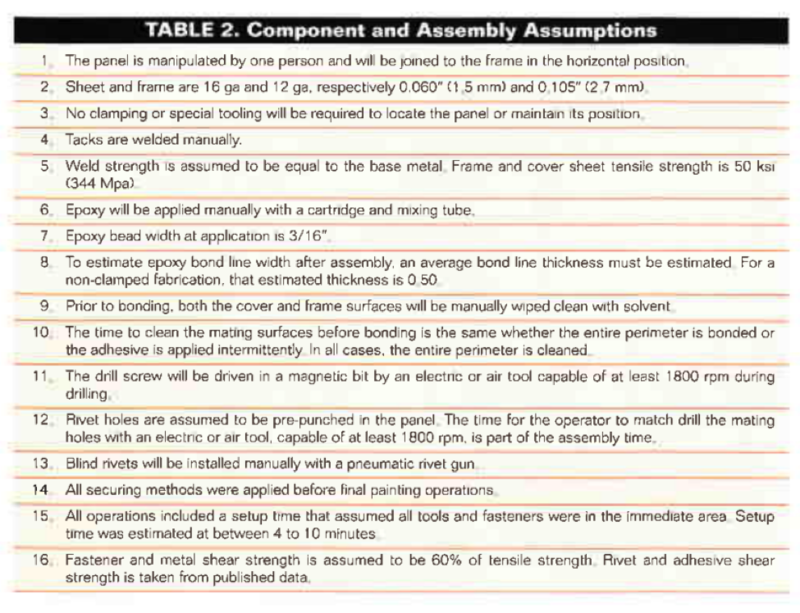 However the potential error of these assumptions pale in comparison to the variation that exists in real world joints. 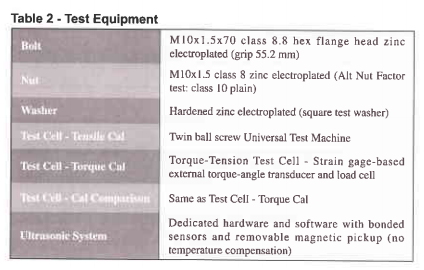 As an example, Figure 3a shows the result of torque-tension testing on the bench-top setup and controlled test conditions specified by published test methods. Even though all fasteners and bearing materials are the same for each test, and are actually swapped out for fresh ones, there is approximately 10% variation within the group. According to both the short and long-form equations there should be no variation at all. Figure 3b shows a similar graph generated from in-torque-tension testing. Using ultrasonic pulse-echo techniques bolt tension can be measured real-time in the actual joint without altering joint characteristics. The graph shown reflects the dynamic torque-tension relationships of single assembly with a circular six bolt pattern. The variation inherent in how components actually fit to one another adds another source of torque-tension variation on top of the variation seen in the bench top test. 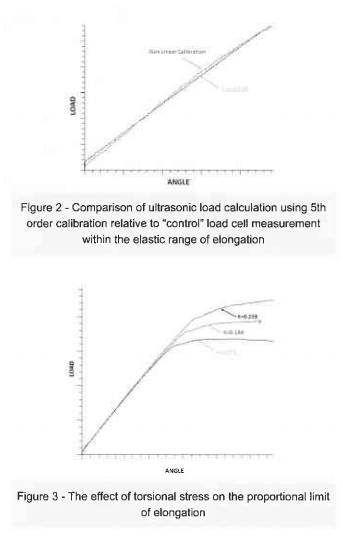 The variation in Figure 3a is primarily due to the fact that the friction coefficients for each sample were in reality not identical. The extreme 60% variation seen in Figure 3b occurred because the joint configuration magnified the effect of imperfect contact. This results in changes to both the geometry and friction variables. These examples illustrate why the relationship between torque and tension can only be accurately determined through testing, where both the mean and distribution about that mean can be determined. 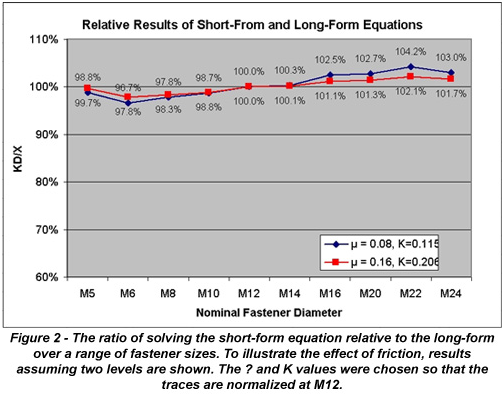 While the nut factor K is the most popular means of quantify the torque-tension relationship in the U.S., in Europe or within organizations that design strictly to ISO or DIN standards, the long-form equations are utilized. 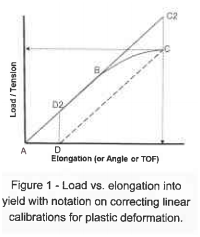 Because separating thread and head friction significantly limits the test equipment that can be used, and eliminates the potential for in-joint testing with actual components, it is common to make the assumption that both under-head and friction coefficients are equal (ISO 16047 estimates a 1%-2% error for this assumption). Using ISO designations, the long-form equivalent of K is shown below to the left of short-form arranged to solve for K. The VDI/DIN designation for µtot is µges Because the terminology used when describing µtot and K are similar (friction factor, friction coefficient), errors are sometimes made by unknowingly substituting one for the other. As shown in Figure 2, to arrive at het same result the value of K is approximately 35% greater than µtot. In summary, the ability to predict the tension in a threaded fasten for a given torque input is largely a function of understanding the friction present between mating surfaces containing relative motion. 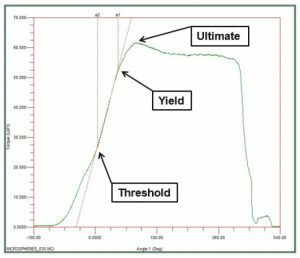 Only testing can accurately determine these friction conditions, which are so sensitive to component variation that only in-joint testing can determine the relationship when controlling bolt tension is critical. Organizations calculating the nut factor K in testing may want to consider the simplified long-form equations (friction coefficients assumed equal) for greater sensitivity over a range applications, particularly when more than nominal diameter is expected to vary. Two of the most commonly asked questions about fasteners are “When should fine-thread fasteners be used?” and “is it preferable to apply torque to the nut rather than the bolt head?” Many different factors influence those decisions, but here are some basic answers to both questions. 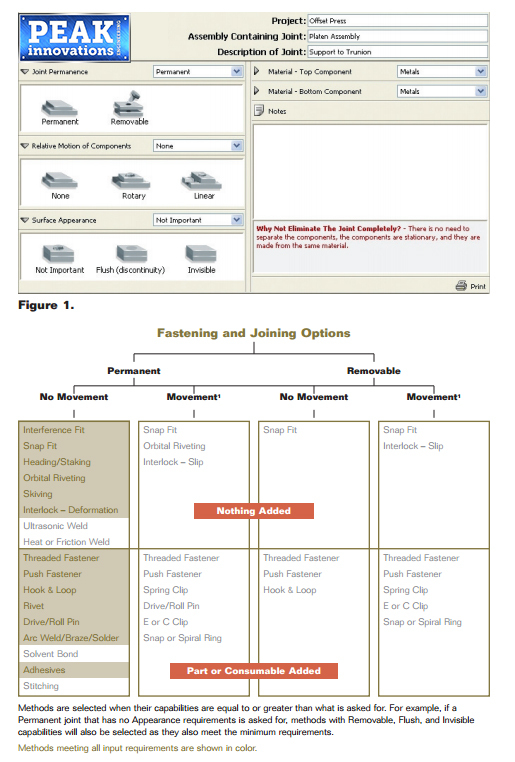 WHEN SHOULD FINE-THREADED FASTENERS BE USED? For a given fastener diameter, as thread pitch decreases, a bolt’s tensile strength increases because the stress area (the smallest cross-section in the threaded portion of the bolt), becomes larger. This increase is approximately 12 percent for standard pitch differentials and since the helix angle of the thread decreases with finer thread pitch, resistance to vibrational loosening will improve somewhat. The reason is analogous to a snow sled requiring more effort to get moving as a hill becomes flatter. On the other hand, finer threads increase the potential for cross threading and take more time to insert, because they require more turns Still, it could be argued that the pros outweigh the cons, so why are fine threads not more popular? Many of the obstacles to more widespread use ale nontechnical. First, the combination of fine and course threads in an assembly or maintenance environment invariably leads to cross-use are, and the resulting problems are usually disruptive and expensive. Other’, more isolated disadvantages can be availability and higher part cost In many cases, the option was simply never considered. So, when should fine-thread fasteners be used? The most obvious answer is in applications where weight and size are the overriding drivers in engineering decisions. For example, aircraft engines use fine thread fasteners exclusively because the increased strength in the same size and weight outweighs all other considerations’. Some manufacturers are missing an opportunity for product improvement with fine-thread fasteners. 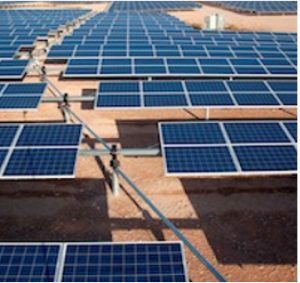 Good applications are highly engineered products in low to moderate production volumes, where power density, weight or size is critical. 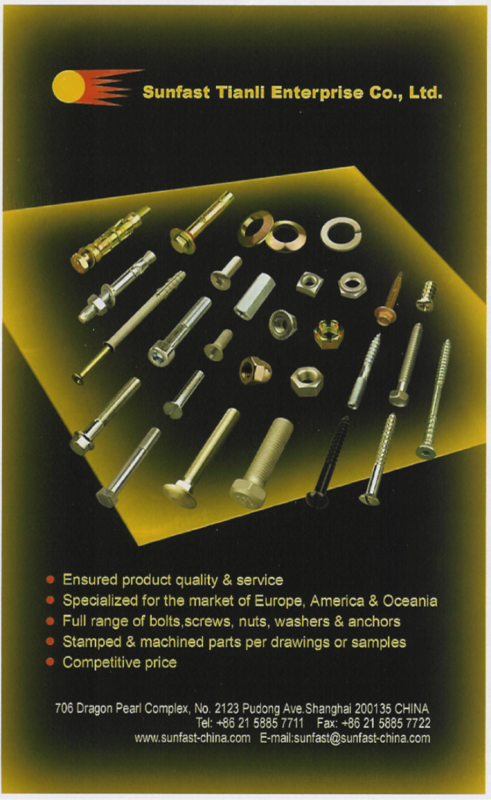 Keep in mind that using higher capacity fasteners does not automatically result in realizing their benefits. Joint testing and manufacturing capability are needed to ensure that their benefits are actually realized. IS IT PREFERABLE TO APPLY TORQUE TO THENUT RATHER THAN THE BOLT HEAD? WHY? In a through-bolted joint, it is generally preferable to turn the nut rather than the bolt head, a key reason is the effect of bolt torsion. When a threaded fastener is tensioned by rotation of either the nut or the fastener itself, torsional stress is created in its shank. How this impacts the nut vs. head question can be illustrated with a hypothetical application that magnifies the influence of bolt torsion. Imagine 0.25-inch (M6) stainless steel bolts being used to clamp together two steel plates each 2 inches thick. If the bolt head were turned and the nut restrained, one could imagine that the combination of a long slender bolt and high thread friction would cause the bolt to twist significantly as torque is applied in fact, the bolt would fail well before the clamp loud predicted by the bolt’s tensile strength could be achieved, due to this high torsional stress being added to the tensile stress created by bolt elongation. 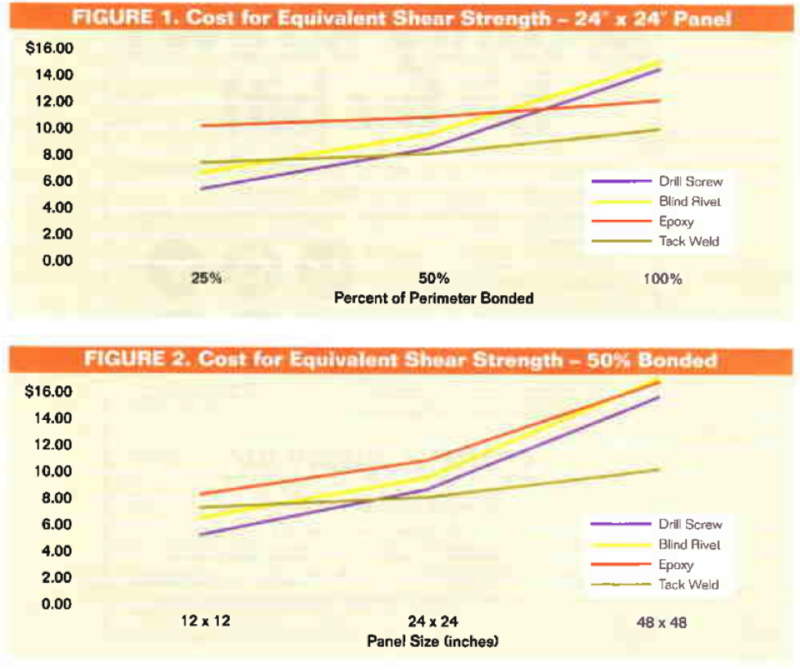 Remember that the published strength of fastener materials is based on pure tensile loading. The combination of torsion and tension lowers the bolt’s capacity. If the bolt head were instead restrained and the nut rotated, this joint configuration would still result in a high level of torsional stress, though not as great as in the first example, because the torque is applied more directly to the threads-the nut does not “wind up” like the bolt. However, by changing key variables, such as relative friction at the interfaces or the bolt’s length to-diameter ratio, the relationship between input torque and resulting clamp load can be varied significantly, to the point where turning the head or nut yields effectively the same result. So, why is turning the nut preferable? 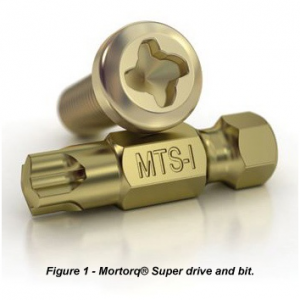 Because, turning the nut removes the portion of torsional stress and stored energy created by applying the torque remotely from the threads at the bolt head. This, in turn, results in more predictable and potentially higher clamp loads. Torsional stress reduces the bolt tension that can be achieved during tightening in all applications, not just this extreme example. Fortunately, this loss is often offset by the fact that fasteners are generally 10 percent to 20 percent stronger than minimum specifications. As a point of reference, we have seen bolts yield during tightening at clamp loads lower than calculated by minimum proof load when the nut factor (K factor) is approximately 0.18 or greater.